by the disaster is staggering, and they need our help. to benefit the Red Cross Haitian Relief efforts. To get the word out, Haitian-American musician Wyclef Jean has collaborated with Starbucks to share how you can help Haiti. 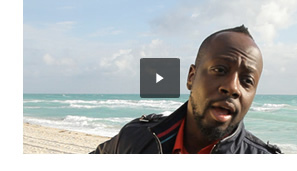 To see Wyclef’s video, go to Starbucks.com and help spread the word. The Starbucks Foundation will join your support by donating $1 million U.S. to the American Red Cross. If you want to donate immediately, you can do so by going online to the Red Cross website. Please take a moment to help in this important cause. In-store donations in the U.S. cannot exceed $249.99. Starbucks cannot provide a tax receipt for in-store donations. If you need a tax receipt, please donate through www.redcross.org. Starbucks assistance in the Haiti relief efforts in no way constitutes an endorsement, express or implied, of any product, service, organization, opinion or political position. We’ve contacted you because you registered at Starbucks.com for news & promotions – or you provided us with your email address. Your address is listed as Email Design. Please let us know if you wish to unsubscribe from this list.